Deliver from 30% - 99% Oxygen; Low - Medium - High oxygen concentrations with one mask. Compatible with standard Nebulizer for Drug therapy. All patient exhalation is filtered through submicron, hydrophobic 3M™filter. Protects	healthcare workers and patients. A closed mask breathing system with integral 3M™ filter maintains respiratory isolation during oxygen and drug aerosol therapy, reducing the risk of airborne infections such as SARS and influenza. Extra large oxygen reservoir ensures highest possible oxygen concentration while intake valve allows patient to make-up air from atmosphere if necessary. 3 mask sizes (Large Adult, Small Adult and Child) ensure best fit possible. Cost effective; Replace Low, Med, High Oxygen concentration and nebulizer masks with one mask. 100% latex free and disposable. 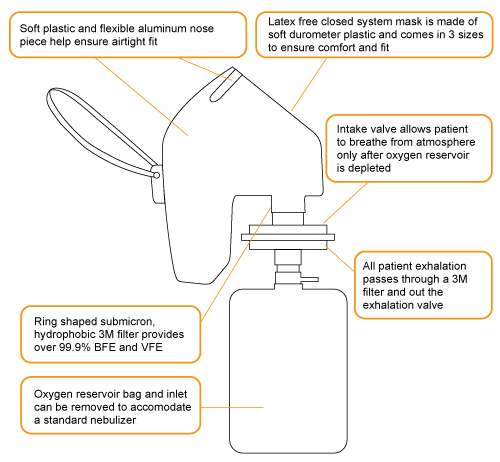 The FLO2MAX oxygen mask has three highly sensitive one-way valve systems that deliver exactly the percentage of oxygen the patient requires by simply adjusting the flowmeter - from 30% to 99%. The sequence of the valve opening order starts when the patient makes an inspiratory effort of 1cm H2O/l/sec. causing the oxygen delivery valve to open; the patient inhales. The exhalation valve cracks at about 1.20cm.H2O/l/sec. and exhalation occurs normally. At times a patient's peak inspiratory flowrate will exceed the flow rate of the supplied oxygen; if that happens the inspiratory valve to atmosphere will open at 1.30cm.H2O/l/sec., allowing supplementary air to match their inspiratory effort and minute volume. If the oxygen supply should cease flowing to the facemask, the patient would breathe normally through the inspiratory valve and exhale through the filter and exhalation valve. When using a nebulizer with the FLO2MAX the oxygen delivery valve will open upon inspiration allowing the medication to travel to the patient. All excess medication and patient exhalation travels through the 3M filter and out the exhalation valve, thereby protecting the care giver from unwanted exposure to medication and possible infection.